In iMindMap 9 you can now share and save work created in iMindMap to even more places than ever before. Whether it's Facebook, YouTube, Twitter, Evernote, Google Drive or Dropbox, the following steps are required to connect iMindMap and your file-sharing or social media accounts. 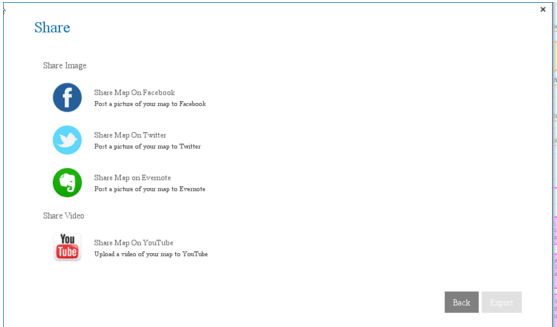 You will then be presented with a popup which will allow you to choose which site you would like to share with. Select File > Save As > and then Dropbox/Google Drive. Your Dropbox/Google Drive will have an 'Apps' folder. This is where iMindMap will save Mind Maps. Any IMX files you put into this folder using Dropbox can be opened in iMindMap. 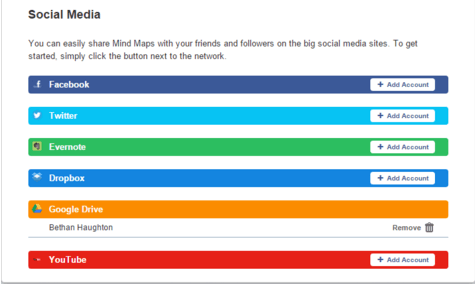 Facebook: Post an image of your Mind Map, you can also use a cropper tool and/or a short message. Twitter: Post an image of your Mind Map, you can also use a cropper tool and/or a short message. Evernote: Save an image with/with out a message to your Evernote account. Google Drive: Save/open files to an iMindMap folder in your Google Drive. Dropbox: Save/open files to an iMindMap folder in your Dropbox account. YouTube: Create a video of your presentation and upload it to your YouTube account.